Astoria OHSET riders Elle Espelien, left, and Kelsey Fausett. 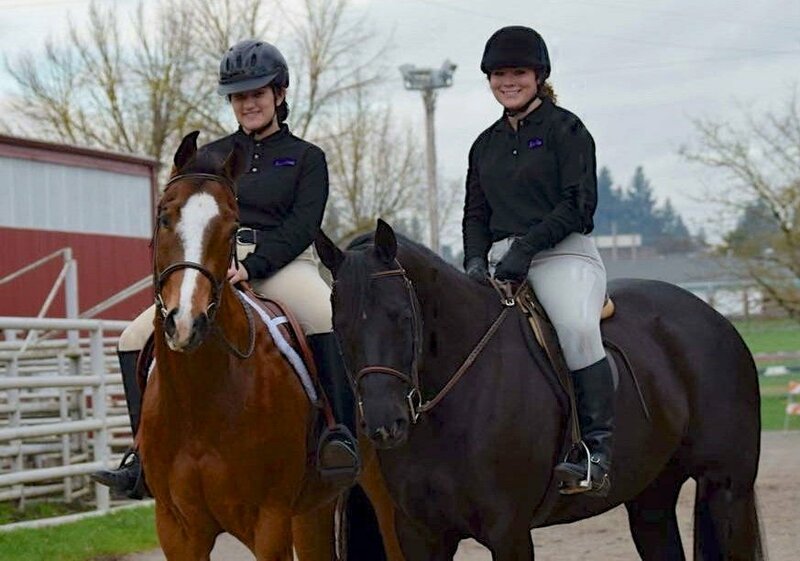 Angelina Linares, left, and Rahlie Osburn compete for Astoria High School's OHSET team. From left to right, Elle Espelien, Rahlie Osburn and Kelsey Fausett. 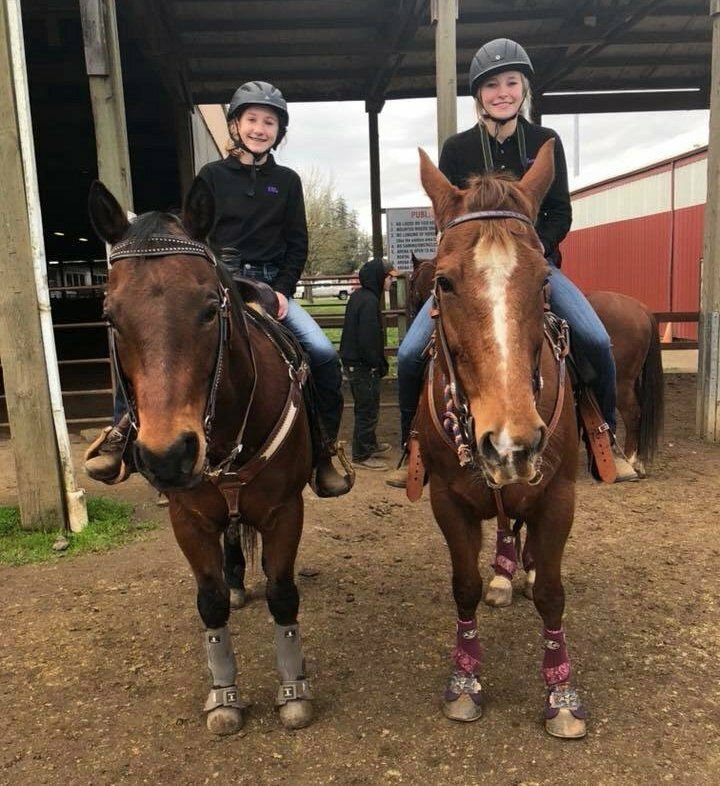 The Oregon High School Equestrian Team from Astoria High School is preparing for its biggest meet of the year, as the girls and their horses head for McMinnville next month in hopes of qualifying for the state meet. The team has three new athletes this year, said Brittany Israel, who serves as the coach. Astoria sophomore Angelina Linares and freshmen Kelsey Fausett and Elle Espelien join returner Rahlie Osburn. Linares, with her horse “Ohso,” shows only in performance while Osburn shows both in performance and gaming with her three horses, “Style,” “Miley” and “Luke.” Fausett (with “Piper”) and Espelien (with “Mojo”) compete in gaming only with their horses. The team’s next meet is April 12-15 in McMinnville, which will determine qualifiers for the state meet in May. At their first meet in February, Espelien took fourth (out of 53 competitors) in the Individual Flags category, and Linares placed sixth in Western. Osburn was 12th and Fausett took 19th in Barrels. In the Two-Man Birangle, Fausett and Osburn placed fourth. Osburn added a 10th place finish in Figure 8 competition and a fourth place showing in Steer Daubing. In a meet earlier this month, Fausett was third in Steer Daubing, with Osburn seventh. Espelien added a 10th-place finish in Keyhole. Osburn was 12th in both Hunt Seat Equitation and Figure 8, and Linares took 12th in Western. Knappa also has an OHSET team, with riders Andrina Andrade, Madison Johanson, McKenzie Johanson, Haylee Skipper, Kourtney Tischer and Sierra Weirup.